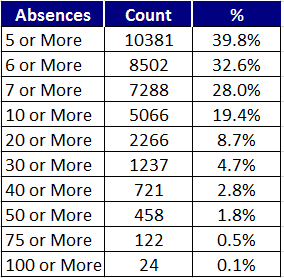 The always helpful Clerk of the School Board, Angela Lewis, sent me a spreadsheet with the number of unexcused absences for each of 26,067 students in 2016. 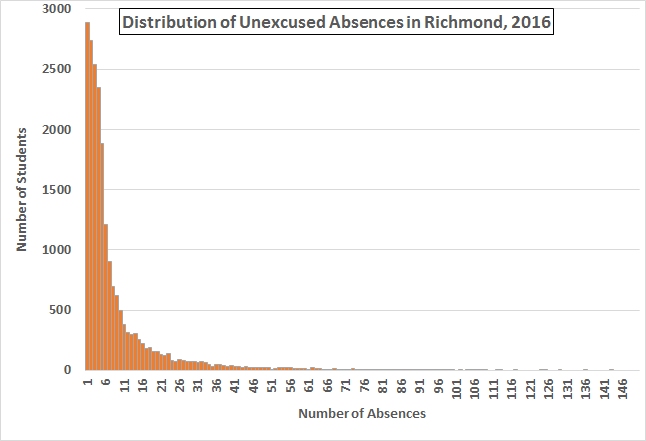 The Big Loser here is the student with 143 unexcused absences. (The runner-up had only 136). That 143 days is 79% of a nominal 180 day school year. All told, the spreadsheet shows 182,100 unexcused absences, an average of 6.99 per student. 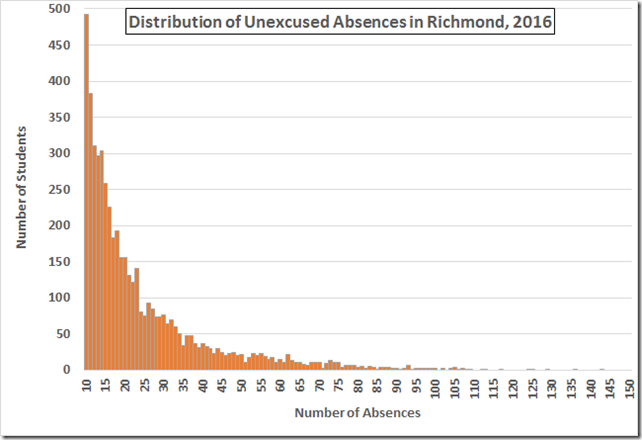 That 6.99 average rounds to seven, which is a magic number: Va. Code § 22.1-258 requires that the Superintendent (or one of his anointed “Attendance Officers”) create an attendance plan after the fifth such absence, schedule a conference with the parents after the sixth, and go to court to either prosecute the parents or file a CHINS petition after the seventh. RPS, responding to an earlier information request, reported 19,742 5-absence plans in ‘16. 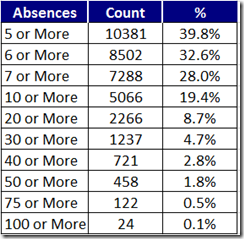 I have no way to reconcile that number with the 10,381 datum from this spreadsheet, albeit they say their count included some (looks like many) “duplicated students.” In any case, both numbers are obscenely large. 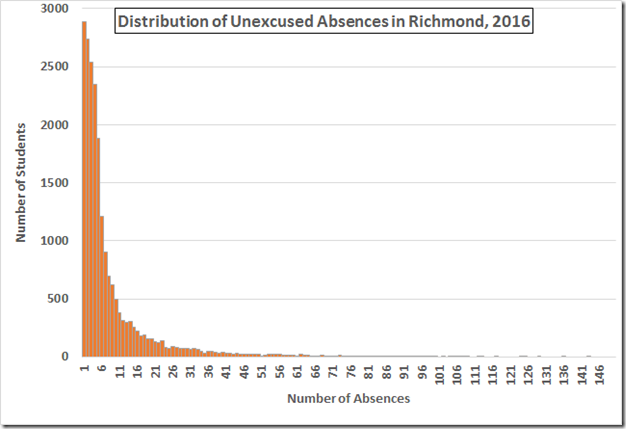 RPS also reported 4008 ten (or more) absence truancies in ‘16, which is a closer match to the 5,066 from their spreadsheet. Either number, of course, is inexcusably large. On the subject, of “inexcusable,” they report 201 prosecutions and 25 CHINS petitions in 2016, for a total of 226, which is 3.1% of the 7,288 required by state law. In his State of the Schools address earlier this week, our Superintendent mentioned the out of school suspensions that “contribute to a higher rate of chronic absenteeism.” He also mentioned the “social issues that stem from the community” and lead to, inter alia, chronic absenteeism. Nowhere in that litany of excuses did he mention the state law on the subject of “chronic absenteeism” or Richmond’s gross and ongoing violations of that law. Joining RPS in this noisome swamp of lawlessness is the State Board of “Education,” which is required by law to enforce § 22.1-258. 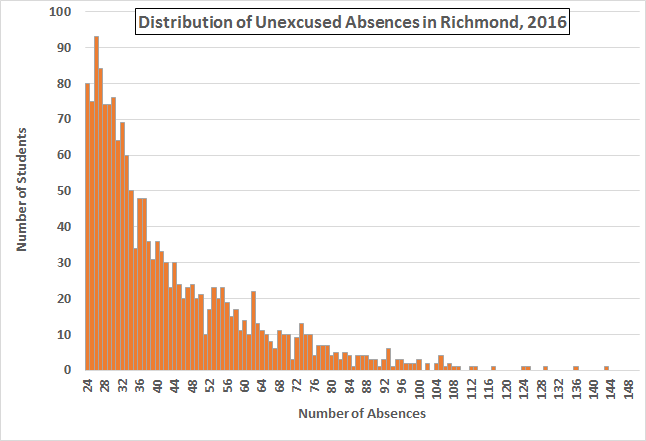 That Board has neither fired the Richmond Superintendent nor sued the Richmond School Board.